After 16 years selling IT services to community banks, Aaron Silva became frustrated with unfair business practices, unethical contracts and one- sided deals that left banks holding the bag. He switched sides in 2007 and dedicated the next 10 years of his career to representing bankers in complex multi-million-dollar IT negotiations against suppliers – greatly leveling the playing field by developing the first ever Blue Book of market pricing intelligence. 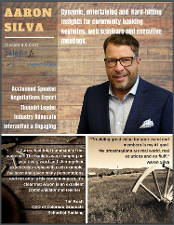 When three Core IT vendors formed an oligopoly controlling 93% of the market, Silva upped the firepower again by launching the Golden Contract Coalition in 2016 bent on aggregating and then leveraging $1 Billion in combined contract value forcing a fair, legally balanced, marketing-conforming contract on behalf of the GCC membership. In this session, Silva will take you through a history of how we [the industry] got into this mess with Core IT suppliers along with his plans - and those of his many community bank and industry partner followers - intended to disrupt the oligopoly of “the Big Three” and change the game once and for all by putting more power back into the hands of community financial institutions. Every banker in the country is affected by critical, complex and expensive relationships with Core IT suppliers. Anticipated competitive offerings promised by new FinTech companies are threatened by the barriers and poison pills embedded in nearly every agreement held by a bank - assuring Core IT suppliers hold all the keys. Attendees to this session will leave with a greater understanding of the clear and present danger faced by every franchise and what actionable steps can be taken to help guide our industry forward.